At this point, The Exiles had finished their own Proteus Saga, ending with him believing he is Morph. This adventure went on for quite some time and went through various alternate universes. The team consists of Blink and Sabretooth from the Age of Apocalypse timeline, Heather Hudson of Alpha Flight, Longshot from our Universe / Mojoverse, Power Princess from Squadron Supreme and Spider-Man 2099, but not the real Spider-Man 2099. For whatever reason, they made an alternate timeline separating from 2099 so that it is essentially Miguel O’Hara that we all enjoy but they didn’t want to damage any potential storylines with the character so this one is safe to use. It seems silly do that diverged from 2099, as they could have had it be current day, for him, storylines and if a new writer wanted to use him, just ignore the Exiles stuff. That is pretty much what they did with Psylocke until the genius that is Rick Remender had Uncanny X-Force travel to the Age of Apocalypse and have her meet former teammate Sabretooth. It doesn’t really come up that often, traveling to alternate timelines. I still say though, that if you know and have traveled to alternate timelines as a regular part of your life, wouldn’t you stress less about events in your own life? Just think about timelines out there that have it so much worst and get over any trivial events that seem to be bothering you. I’ve been rewatching Sliders lately, as I’m up extremely late each night, I’m only on the fifth episode on Netflix of season one, I remember the show being much better. Maybe I’m remembering seasons two and three and we haven’t gotten there yet. I know it falls apart for the final season, once Jerry O’Connell was gone, so was I. I like Rembrant but I need more than the one original character to stick with it. Plus the whole Merged Quinn thing seemed silly, either kill off the character or give him a happy ending. Also at this point of the series, the Exiles know that the Timebroker, a nice chubby man, isn’t really who is controlling them. No, there are time bugs living in the pink palace called the Panoptichron, that has been sending them on their missions. I like whenever Calafiore was penciling the book, and Chu really colors his work correctly. Calafiore has this clean cartoony (might not be the right word) style that keeps the title fun but exciting. It definitely isn’t a kid book but it is easy on the eyes and easier to follow. Issue opens with Power Princess wanting to kill Morph, as she caught him watching her bathe. Which I feel like around this time, over in JLA, Plastic Man had done a similar thing with Big Barda, taking the shape of a dress of hers and having her wear him. I guess shapeshifters will do funny things like that. Is Reed Richards the only shapeshifter who isn’t a funny character? Are there villains with that power that are not wacky? Also, there is a distinction for these types of shapechangers and characters like Mystique? Thing shapeshifters and Person shapeshifters? There must be a word by now. Morph has chosen to play it safe by taking the shape of Longshot to spy on her. Turns out, she was bathing in the ocean portion of the Panoptichron. This is all revealed as Power Princess tears him in half with her shield, now we know it has been Morph for the past few pages. Heather and Longshot come across the fight and Zarda realizes that she didn’t just kill Longshot for spying on her. Longshot asks why Morph took his shape instead of using his own which Zarda correctly accuses Morph of doing it as he knew it was wrong. They worry this is the Proteus personality coming to the front of Morph’s mind. Heather announces that she is leaving it head back to her reality for a brief vacation. Heather is the leader of the Exiles as well as runs the day to day operation of the base. She informs them that the bugs will be able to handle any issues until she returns. Before she leaves, the bugs, or Timebreakers as they probably would like to be referred to as. But these bugs are the worst so screw that! The bugs try to tell her that there is a universe in danger, she tells them that that universe can wait a few days. We get an aside between the two bugs. They use to trick the Exiles into going on missions but now they have to gently push them to do what they want. The bugs try one last ditch effort to warn Heather of the consequences of inaction, which she counters with a reminder that it was the bugs who ruin the multiverse in the first place. After she has visited her husband, she will return to fix all of the problems the bugs created. Morph wants to visit his home universe and Longshot states that he can’t as he is worried about Proteus being left on his own. Morph wants to know the reason and Power Princess steps in and states that they can’t be leaving the bugs alone. Longshot wonders how Blink is holding up. Transition to Blink on Earth-12, which was Mimic’s universe. I had originally bought this comic as I was buying it as part of my pull list. Now that I’m only keeping Kitty, Lockheed and Magik appearances, it was in my boxes to sell. Then over at the Marvel Comics Database, http://marvel.wikia.com/Main_Page, one of my new favorite websites, they had Shadowcat of Earth-12 making an appearance in this issue. To me, she looks like how I imagine Gambit looks in this universe. The X-Men of this world first appeared in issue 14 of Exiles and they only had a limited amount of X-Men, consisting of Cyclops, Xavier, Jean, Kurt, Storm, Colossus, Wolverine and Kitty plus Mimic. So no Gambit so this has to be Kitty in this issue, plus she is standing awfully close to Colossus. The one panel of her in the background is the only appearance of her in the issue, so we have to take MCD with their suggestion of who that character is. Looks like a man and too tall for me but they know what is up more than I do. Also, issue 14 and issue 84, is close to six years of comics between the two issues and I wasn’t paying that close attention back then. Amazing that this title lasted that long but it was a different Marvel then. Blink is on Earth-12 for Mimic’s funeral. They are back at Xavier’s for the wake. The X-Men of this world are gathered to remember their fallen friend. Cyclops, jokingly, asks Blink if they ever came to any other worlds where Mimics beat Wolverines, just to annoy Wolverine. She is about to answer in the affirmative when Wolverine gives her a, dream on. Blink and Mimic were in a relationship when he died. Jean is glad they found each other while they had a chance. 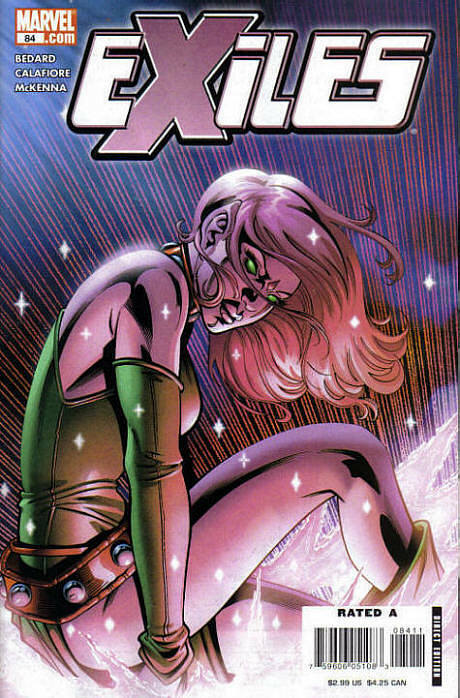 The X-Men really like Blink and she likes them. Xavier is glad to hear that as he offers her membership on the team. Blink is pretty shock. On Spider-Man 2099’s world, he is finding his brother, Gabe. The reason why Miguel is on the team is that Proteus unmasked him in front of a slew of cameras so the whole world knows his secret – also probably why Marvel wanted to make this an alternate Spider-Man 2099, as that would be hard to undo, little did they know they would do this with the Proper Peter Parker Spider-Man in a story that would turn me off on the character forever (six years and counting!). Which I should state, it is nice to read a Spider-Man again, even for an issue. I know he has become a regular member of Superior Spider-Man, which I tried to read as I do like the character. It read as a big mess, of why he is back in present day Marvel but it has to be pretty complicated to explain why a future character will waste time in their far past. Spider-Man is there to make sure his brother and mother are fine. They are, if not better as they are being treated like celebrities – celebrities who are liked by the general populace. They are being followed for sure, by the Public Eye but treated fine. Miguel leaves, not telling Gabe where he is going as then Gabe would have to lie about where Miguel is. On the Age of Apocalypse dimension, which I could o a whole series of visits to home worlds and different timelines. That’s my problem right now with Sliders, is that if you are not interested in that one dimension, then that whole episode is hard to get through but there are plotlines that are continued so you have to watch it. Sabretooth is speaking to Magneto and Rogue, who are married in this universe. I would have liked to see their son Charley in the room, but that’s just me. Sabretooth is looking for Wild Child, a character I’ve always looked upon as Sabretooth Lite. Wild Child is unaccounted for. Magneto doesn’t know if Wild Child is dead or alive but they are looking and it is a top priority. Rogue gets a line about how Wild Child hasn’t been the same since Sabretooth left. I only know Wild Child from his stint on X-Factor when both Sabretooth and Mystique were members of the team. Once I revisit Age of Apocalypse (for sure in 2016 to tie in with that movie but one imagines I could get there sooner) I need to reread those issues to recall AoA Sabretooth as I only really know him from Exiles. Looking at his list on comicbookdb and then my collection, I own these issues of his Pre-Exiles : X-Men Chronicles 1 & 2, Age of Apocalypse : The Chosen, Amazing X-Men 4 and X-Men : Omega. I have X-Men : Alpha on my wishlist. It makes sense now why I have no memory of him, he was on Astonishing X-Men and I only have one issue of the other X-Men title, Amazing X-men and only issue 4 of that one. I barely remember him from the other titles. Chronicles was an anthology two issue series, Chosen was a handbook, Amazing lead into Omega. Alpha, naturally, was the first part of Age of Apocalypse. Magneto wonders if Wild Child would come out of hiding if he knew Sabretooth was back. He asks when Sabretooth and Blink are expectant back. Sabretooth is about to answer when the Tallus, the device that teleports the Exiles and lets them know what needs to be fixed before they go home. Sort of like their Ziggy from Quantum Leap. Which this series was an odd mix of X-Men, Sliders and Quantum Leap, maybe why I liked it so much and was hooked on the series from the beginning. I followed this into New Exiles by Chris Claremont and then the third attempt of the title by Jeff Parker (Exiles Volume Two). I only kept issue two of that second volume. I loved New Exiles as it had Chris Claremont writing, had an alternate Kitty Pryde and they printed one of my letters that so happen to be answered by That Cat Pryde that month, issue 11. Along with Deadpool volume one’s 54, it was my second letter published. She is only there for a day or two more. Then Sabretooth teleports in, and he is surprised to see the location he has been transported too. Sabretooth is super embarrassed about interrupting them and turns his back. He explains that he is there as Heather’s world is in danger. So both teams are united, and there is a line about how they have already done the introductions, which would have been nice if they had at least thrown up captions around the members of Alpha Flight as it would make this job here a little easier. For the Exiles – Blink, Power Princess and Spider-Man join Sabretooth and Heather. For Alpha Flight – Guardian (James), Aurora (who doesn’t appear to be crazy) and Northstar, Box, Puck, Marrina (in a mermaid shape), Shaman and Snowbird. Apparently what distinguishes Heather’s timeline from others is that the Cold War hasn’t ended yet. It is getting closer to ending but Russia has one last plan up its sleeve. They want to use Darkstar’s connection to the dark dimension, where their elder god, Cheronbog lives. I’m under the impression that Darkstar’s Darkforce comes from the same place as Cloak’s cloak’s dimension. Darkstar are at the North Pole along with her fellow Soviet Super Soldiers – Crimson Dynamo, Red Guardian, Ursa Major and Vanguard. If successful, Cheronbog will come to their aid and demolish America and really, the rest of the world as there would be a nice layer of Dark Force around the planet. I never understood the idea of heroes flying to their destination but they force those who can fly on their own to fly outside the plane. Is that really the best use of their abilities? Wouldn’t that tire them out? Just doesn’t seem fair to me. Blink reveals that she has an offer to join Earth-12’s X-Men but she isn’t sure if she wants to accept it. Sabretooth wants to know if she is considering or was considering the offer. The heroes fight the Soviets. Shaman sends illusions to throw off their foes. Darkstar has been at this for three days, so she is tiring. Three days, clever of Bedard to reveal the time period as that must be how long the bugs have been trying to get Heather to pay attention to them and the threat. If they told her it was her world, she would have perked up, I’m sure. Gusrdian and Power Princess knock out Crimson Dynamo. Darkstar loses her concentration before she can succeed. She did enough though, and her portal continues to gain strength. Morph wants to help and gets the bugs to teleport him to the action, leaving Longshot behind. Instead of teleporting him to the Exiles, he is smack in the middle of the Soviets. Aurora and Northstar try to use their combined light powers onto the portal, to no effect. Longshot decides to head to the dimension. Leaving the bugs alone. There is an ad for the Ultimate Clone Saga starting with Ultimate Spider-Man 97. It isn’t very good, no Scarlet Spider costume is seen. Also, Ultimate Kitty doesn’t show for the majority of the story. Snowbird knocks the god back and the day is saved. Sabretooth tells the bugs they are ready to come back to the base. Then his Tallus disappears from his forearm. The Timebroker informs them that they have been fired, thus the issue ends.